The U.S. government presents itself as the beneficent superpower, but the reality of Washington’s endless wars and lavish spending on bombs – while millions face starvation and disease – suggest a different reality, as Kathy Kelly notes. The Sisters have embraced numerous projects to protect the environment, welcome refugees, and nonviolently resist wars. I felt grateful to reconnect with people who so vigorously opposed any Irish support for U.S. military wars in Iraq. They had also campaigned to end the economic sanctions against Iraq, knowing that hundreds of thousands of Iraqi children suffered and died for lack of food, medicine and clean water. This year, the Sisters asked me to first meet with local teenagers who would commemorate another time of starvation imposed by an imperial power. Joe Murray, who heads Action from Ireland (Afri), arranged for a class from Dublin’s Beneavin De La Salle College to join an Irish historian in a field adjacent to the Dunshaughlin work house on the outskirts of Dublin. Such workhouses dot the landscape of Ireland and England. In the mid-Nineteenth Century, during the famine years, they were dreaded places. People who went there knew they were near the brink of death due to hunger, disease, and dire poverty. Ominously, behind the workhouse lay the graveyard. The young men couldn’t help poking a bit of fun, at first; what in the world were they doing out in a field next to an imposing building, their feet already soaked in the wet grass as a light rain fell? They soon became quite attentive. We learned that the Dunshaughlin workhouse had opened in May of 1841. It could accommodate 400 inmates. During the famine years, many hundreds of people were crowded in the stone building in dreadful conditions. 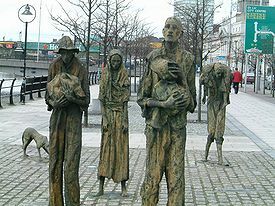 An estimated one million people died during a famine that began because of blighted potato crops but became an “artificial famine” because Ireland’s British occupiers lacked the political will to justly distribute resources and food. Approximately one million Irish people who could no longer feed themselves and subsist on the land emigrated to places like the U.S. But seeking refuge wasn’t an option for those who couldn’t afford the passage. Evicted by landowners, desperate people arrived at workhouses like the one we were visiting. Our guide read us the names of people from the surrounding area who had been buried in a mass grave behind the workhouse, their bodies unidentified. They were victims of what the Irish call “Greta Mor”—”The Great Hunger.” It was recently, as I tried to better understand the migration of desperate and starving people now crossing from East Africa into Yemen, that I began to realize how great the hunger was. During that same period as the Irish famine — in the latter half of the Nineteenth Century — there were 30 million people, possibly 50 million, dying of famine in northern China, India, Brazil and the Maghreb. The terrible suffering of these unknown people, whose plight never made it into the history books, was a sharp reminder to me of Western exceptionalism. 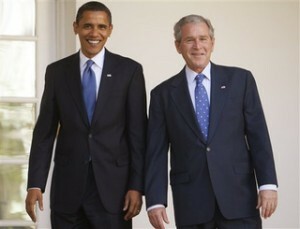 Barack Obama and George W. Bush at the White House. As researched and described in Mike Davis’s book, The Late Victorian Holocaust, El Nino and La Nina climate changes caused massive crop failures. What food could be harvested was often sent abroad. Railroad infrastructure could have been used to send food to people dying of hunger, but wealthier people chose to ignore the plight of the starving. The Great Hunger, fueled by bigotry and greed, had been greater than any of its victims knew. And now, few in the prosperous West are aware of the terror faced by people in South Sudan, Somalia, northeast Nigeria, northern Kenya and Yemen. Millions of people cannot feed themselves or find potable water. Countries in Africa, which the U.S. has helped destabilize such as Somalia, are convulsed in fighting which exacerbates effects of drought and drives helpless civilians toward points of hoped-for refuge. Many have chosen a path of escape through the famine-torn country of Yemen. But the U.S. has been helping a Saudi-led coalition to blockade and bomb Yemen since March of 2015. Sudanese fighters aligned with Saudi Arabia have been taking over cities along the Yemeni coast, heading northward. People trying to escape famine find themselves trapped amid vicious air and ground attacks. In March 2017, Stephen O’Brien, head of the United Nation’s Office for the Co-ordination of Humanitarian Affairs, traveled to Yemen, Somalia, South Sudan and Northern Kenya. Since that trip, he has repeatedly begged the U.N. Security Council to help end the fighting and prevent conflict-driven famine conditions. Regarding Yemen, he wrote, in a July 12, 2017 statement to the U.N. Security Council that: “Seven million people, including 2.3 million malnourished (500,000 severely malnourished) children under the age of five, are on the cusp of famine, vulnerable to disease and ultimately at risk of a slow and painful death. Nearly 16 million people do not have access to adequate water, sanitation and hygiene, and more than 320,000 suspected cholera cases have been reported in all of the country’s governorates bar one.” This number has since risen to 850,000. Ben Ehrenreich describes famine conditions along what the Israeli theorist Eyal Weizman calls the “conflict shoreline,” an expanding band of climate change-induced desertification that stretches through the Sahel and across the African continent before leaping the Gulf of Aden to Yemen. He notes that this vast territory, once the site of fierce resistance to colonial incursions, is now paying the heaviest price, in disastrous climate conditions, for the wealth of the industrialized north. As the deserts spread south, ever more dire conflicts can be expected to erupt, causing more people to flee. 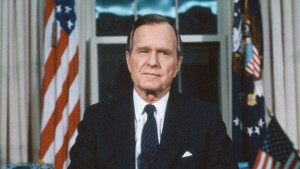 President George H. W. Bush addresses the nation on Jan. 16,1991, to discuss the launch of Operation Desert Storm against Iraqi forces. In 1993, at the Rio de Janeiro “Earth Summit,” delegates conveying the views of then-President George H.W. Bush, voiced a refrain of the statement, “the American lifestyle is not up for negotiation.” U.S. demands of the summit incalculably restricted the changes to which it might have led. There is danger that must be recognized. The danger is real and the danger is spreading. Violence spreads the famine, and the famine will spread violence. 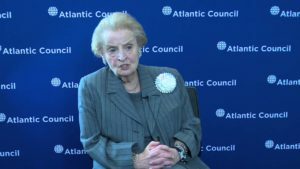 Former Secretary of State Madeleine Albright speaking at an Atlantic Council event. I find myself repulsed by assertions voicing U.S. exceptionalism, yet my own study and focus often omits histories and present realities which simply must be understood if we are to recognize the traumas our world faces. In relation to conflict-driven famines, it becomes even more imperative to resist the U.S. government’s allocation of $700 billion to the Department of Defense. In the U.S., our violence, and our delusions of being indispensable stem from accepting a belief that our “way of life” is non-negotiable. Growing inequality, protected by menacing arsenals, paves a path to the graveyard: It is not a “way of life.” We still could acquire a great hunger: a transforming hunger to share justice with our planetary neighbors. We could shed familiar privileges and search for communal tools to preserve us from indifferent wealth and voracious imperial power. We could embrace the theme of the Irish sisters at their Feile Bride gathering: “Allow the Voice of the Suffering to Speak” and then choose action-based initiatives to share our abundance and lay aside, forever, the futility of war. She doesn’t mention that God is on our side, so all is well. It is time that we the people of planet earth changed our ways. All our troubles seemed so far away. Now it looks as though they’re here to stay. Oh, we believed in yesterday. We’re not half of what we used to be. There’s a shadow hanging over ‘we’. Yesterday was such an easy game to play. Now we need a place to hide away. The element in the world that feel’s that life owes it an extravagant, luxurious living, need’s to get a grip on reality. The element riddled with the God Complex. That utilizes a nations assets, resources & populous to facilitate it’s, & it’s co-conspirators ridiculous life style. This practice of keeping our friends & buddies in business in a life style they have all become accustomed to – with massive borrowings using their nation as security – is out of the question. We the people of planet earth need to pull things back into perspective that is viable & sustainable. I couldn’t agree more; this is a very powerful article. Just a tip, though, the correct spelling of the term is An Gorta Mór. The problem was that the United States muscled out Great Britain as the next Global Empire and Great Britain had centuries of experience with this and felt it was a British duty to civilize the rest of the world because it was the White Man’s Burden. Look at how well run and rich countries like India and South Africa and dozens of others were when Britain was running things. With the United States in charge of the world everything has gone down hill and it will soon be eclipsed by the Chinese who will do a much better job. The USA is the most evil nation on the Earth. If anyone wonders what the definition of evil is – the behavior of the USA is that definition. Scott Peck’s book People of the Lie describes how those who consider themselves exceptionally good, are those capable of the greatest atrocities. These are people who think themselves so good and perfect, that they will never acknowledge their heinous crimes, even to themselves. These are folks who believe their worst crimes were all justified in the name of some supposed virtues. They take satisfaction in destroying those they have labeled as evil. It is inconceivable for them to apply that label to themselves. Sick people are in charge. 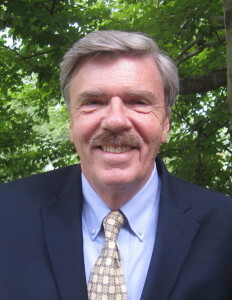 Most of the men wear black suites with manly shoulder pads. The women are crones concentrating on getting more and punishing anyone in their way. Imagine grinning conservatives supporting regime change wars that require foreign nation building plus a bloated homeland government managing huge federal debts to pay for war during global climate collapse. It’s a really sick story we happen to be living in. Not worrying means we have no idea of the story we are living in. The only way out is to wake up to the nightmare – but that takes courage and honesty that we seem to be lacking. Spot on! The USA has such a history of violence, shrouded in the self-deception of “doing good”, that violence, hypocrisy and paranoia have become such integral components of US culture as to appear genetically endemic. The populace is brain-washed, history is re-written, facts are distorted, enemies are falsely created, bullying is regarded as normal behaviour, the rich get richer, the poor poorer – and all this escapes the intelligence of all but a relatively helpless few. God bless America? God help America more likely. They are psychopaths. Without empathy or conscience, they play the American people like fiddles. And the American people react to their abusers with every dog whistle issue the elite choose. I’ve read the people of the lie more than once and it was frightening. There is a little of each of us in that book. And a whole lot of this government in it too, for it exemplifies the vicious evil we are dealing with behind the puppets assigned to run the show. Chris Hedges recently did a brilliant piece on the fall of the American Empire. I believe this is what we’re seeing in real time. I don’t hold out much hope that the people will wake up before it’s too late. No matter how patriotic and flowery Madeline Albright makes it sound, sanctions, embargo’s, and scorched earth polices, are war crimes when it effects the innocent people who live inside of these nations of our invasion. We Americans need to wise up, and wise up quickly, if not for to avoid the coming blow-back, but to find away to become good human beings. If we should accomplish this then we may consider our American souls to be exceptional. If we should do the right thing, then we also may consider ourselves to be just descent and good, and forget the exceptional. Then we will have joined the human race, and with that then we will have become great again, if ever we were great in the first place. The coming blow-back? It has already begun! 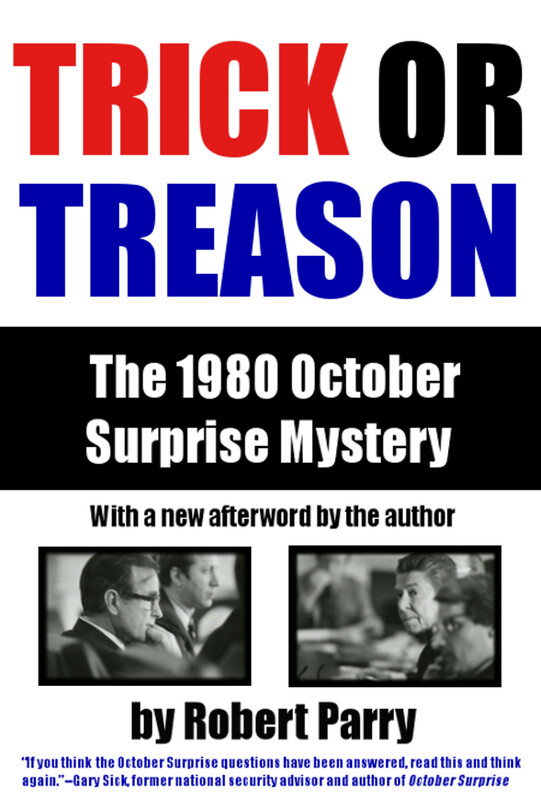 What was 9/11, if not blow-back? Is not the Las Vegas massacre blow-back from within? Correction ‘coming blowback’ change to read ‘the Now blowback’. If the US had spent the billions wasted on war since WWII, on building the roads, schools, and hospitals of the developing nations, we would have eliminated poverty for the poorest half of humanity, a true American century, and we would have no enemies. Instead we have willfully killed over six million innocents for nothing, have destroyed democracies and replaced them with dictators, and have allowed the MIC/Israel/WallSt oligarchy to control our former democracy with campaign bribes, control of mass media to promote violence as patriotism, promiscuous surveillance, and militarized police. They have destroyed America and have spent all we could borrow on destruction for their personal gain. We have the lowest per capita foreign aid of all developed nations, almost all of it military “aid,” a total of less than one meal a year for the world’s poorest. While Americans must “find away to become good human beings” they cannot until they have destroyed the oligarchy that controls elections and mass media. 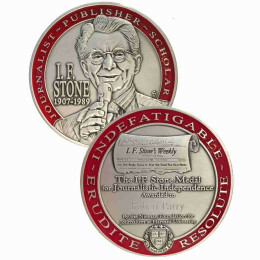 So long as we advocate domestic peace we shall instead have war, because such tyrants speak and respond only to force. Their only concession since WWII was the Civil Rights Act of 1964, because they were afraid of the riots in the cities, so they pretended to be persuaded by the likes of MLK. But now they have militarized the police and ignore all protest. There will be no progress until the poorest rise in rebellion to terrorize the rich, and infiltrate police and national guard to deny force to oligarchy, the first sign of progress. Note that the author cites Jewish names (Ehrenreich and Weizman) and their own “holocaust” to get published in the US, despite the hundreds before who taught them. Especially ironic her being patriotic and all the ‘we-we-we’ regarding the US, we-must-do-this, we-see-that. we-must-attack-X,Y,Z when she is not originally an American herself and does not even use her real name. I agree with what the author has written here, but I feel she overlooked some points. The British Empire didn’t confine its indifference to starvation to the Nineteenth Century. As the colonial power in India, they were directly responsible for the 1943 Bengal famine which caused the death of millions. Regarding Ireland, the Brits had a hell of a lot of blood on their hands with their misbehavior there, but so did the Catholic Church. That massive die-off was inevitable sooner or later, even if not a single sack of grain had been shipped out of Ireland in the late 1840s. After all the starving people died, and after the massive migration, the shell-shocked Irish took matters into their own hands. Remaining unmarried, or delaying marriage for years reduced the number of births. I strongly suspect that other measures were used as well. Irish women would have known which local plants could act as abortifacients, and I suspect that knowledge was discreetly passed around and used. In other Catholic nations disguised infanticide has been a way of keeping the population numbers down, and I suspect that was used too. 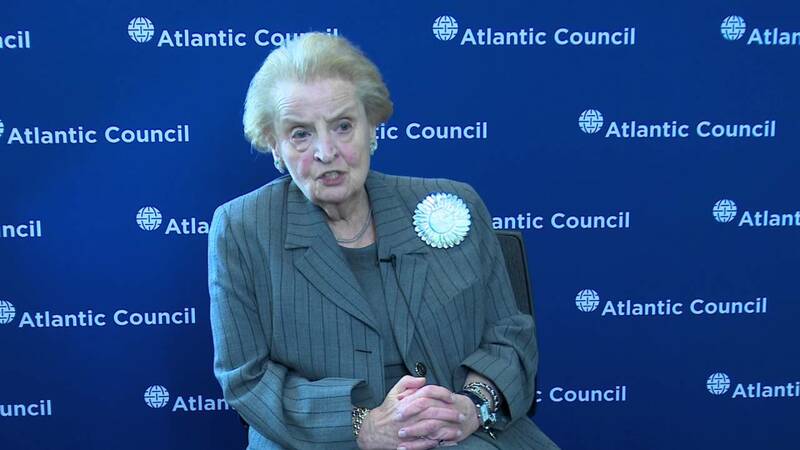 By the bye, I hate it when photographs of that horrible ***** Madeleine Albright are displayed. She turns my stomach as much as anyone I know.